This Pine Wood Oriental Garden Bridge spans gently over a moving stream or completes a pathway through a small drainage ditch. American made out of knot-free, untreated, Southern Yellow Pine Wood in our Amish wood shops in Pennsylvania. Our talented craftsman take the time to create a top quality product. This 4' x 10' bridge has a slight arch to keep it from feeling flat while adding a picturesque path across a small, shallow stream or as an entrance to your garden. During full bloom in springtime, as the grasses and wildflowers surround the low railings, your landscape will appear straight from a fairy tale. Choose your stain to match your your fencing or decking seamlessly. Look to dimensions or the blue 'Customize it' button on the right of the product to review all nine Natural Kote stains and paints. 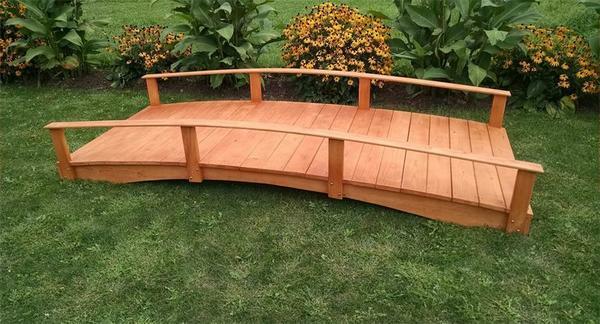 Beautify your outdoor setting with the tranquil natural Pine Wood Oriental Garden Bridge. Delivery is without a liftgate service and may require an appointment. If you would like to order a liftgate with your delivery, please call us at 1-866-272-6773. There is an additional $75 charge for a liftgate.